I could hardly wait to start creating some looks using my new Glamour Doll Eyes samples, so I decided to start off by putting together a very dark and whimsical midnight inspired look. I can't express how much I'm in love with their 'Celestial Crow' eyeshadow, and I decided to throw a little bit of of one of my other personal favourites, 'Jayne', into the mix. This midnight blue shade would look incredible on hazel eyes, so if you're lucky enough to posses those hazel peepers, I'd definitely recommend checking this eyeshadow out! Gorgeous! 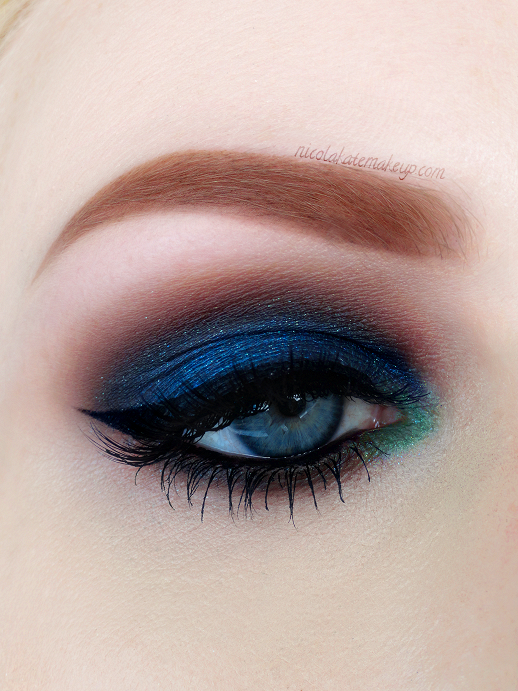 I'm deeply in love with brown blended around a dark/navy blue eyeshadow. It's like my weakness. And I love the greeny show you placed in the inner corner. Thanks, Ava! I love this combination, too. I think this is one probably one of my favourite looks I've ever done. Thanks for the feedback, Sylvia - I'm really pleased you like it! This is stunning! I also love the way the brown blended with the blue - I actually thought it was MAC's Club eyeshadow (or any of the multiple variations of, and one of my favorite shadows) because it doesn't just look plain ole brown; the way you blended it really managed to give a matte brown some extra depth. I've been meaning to buy MAC's Club shadow but I've never gotten around to it, but it's definitely on my list! I particularly love this Bodyography Expressions powder though. Such a rich colour, highly pigmented and blends like a dream. And thank you for the eyebrow love, heh!